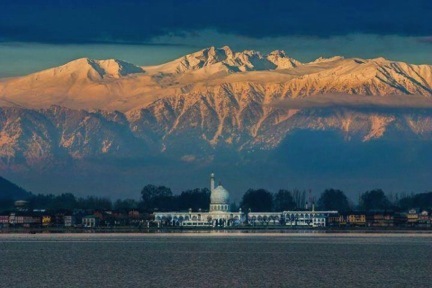 Kashmir is an extravagantly beautiful place. Its limitless awe of snow peaked mountains, roaring rivers, lush green meadows, lakes and springs enchant you with a heavenly experience as a traveller. Its people, like its landscape are beautiful. They have seen the worst of times but have never forgotten how to smile. But outside its boundary is a bad world. A world of those people who were part of a nation who only realised 60 years back that they were different. They have everything in common; language, culture, physical features, food etc and we have nothing in common with them. Yet our destiny was defined and decided by the people of these countries called India and Pakistan. After the partition of British India in August 1947, two new countries came into existence based on religion. Hindu majority so called secular India, and Muslim dominated so called Islamic Republic of Pakistan. The logic behind the creation of Pakistan based on religion is debatable, for the fact that today more Muslims live in India than Pakistan. But as they say, everything is logical in the game of politics in the subcontinent, as long as you are playing with emotions. Kashmir was a separate princely state, with its own ruler and was given the choice whether to join India or Pakistan, or to stay a separate state. Kashmir was a Muslim majority state, and if asked democratically which country it would like to join, the majority of Kashmiri’s would have chosen to join neighbouring Pakistan at this time. But as the ruler of Kashmir was Hindu, Pakistan doubted his intentions to join. In October 1947 Pakistan attacked the western borders of Kashmir and the Hindu ruler sought help from India. A short war between the new nations of India and Pakistan resulted in a United Nations ceasefire, and divided the great land of Kashmir into Indian Kashmir and Pakistan Kashmir. The United Nations passed a resolution stating the people of Kashmir be given the right to self-determination, to choose the future of their country. But to date The United Nations has failed to implement any of the resolutions it passed in 1948. This was a significant blow to the credibility of these nations, who still had blood on their hands from the millions massacred during the religious partition. Since then nothing has changed for Kashmiris, except time. I was born in Indian occupied Kashmir, during the 1980’s. This was the decade, which saw Kashmiri resentment brewing against Indian rule. I am a part of the generation that during the early 90’s saw the political landscape of Kashmir transform. Kashmiris, backed by Pakistan, launched an indigenous armed struggle against Indian rule. India, the world’s largest democracy was ready to crush it in the most undemocratic way. We saw ourselves caught between two walls, and this impacted hugely on Kashmiri society and culture. Pakistan gave our struggle an Islamic narrative, advocating our cause as the fight for Islam. Some sections of society became increasingly violent, and suppressed intellectual and secular classes. During my generation 40,0000 Kashmir Hindus, who had lived in harmony alongside Kashmiri Muslims for decades, were forcibly asked to leave their motherland. A tragedy we Kashmiri Muslims feel ashamed of to this day. Meanwhile, India conveniently convinced the international community that the conflict was an Islamic movement sponsored by Pakistan. Everything in Kashmir started disintegrating. There was chaos everywhere. Armed clashes, military crackdowns, militant interferences into the daily affairs of people, killings, torture, and injustices were the norm. Growing up, I remember this as a daily routine. The Indian army would cordon off an area and ask people to come out of their houses to look for the militants. There were atrocities and torture committed by Indian troops on the ordinary people of Kashmir. The majority of Indian troops were illiterate and came from impoverished parts of India. Their presence was intrusive, and as Kashmiri’s we could not understand what right they had to search our homes and torture us. But the atrocities were not inflicted just by the Indian military, but also by the so called ‘freedom fighters’ who promised us freedom from Indian occupation. These fighters soon diverted from the cause, and began interfering in Kashmiri society, harassing ordinary people, suppressing any opinions they didn’t agree with and giving religious diktats. Every aspect of Kashmiri society was breaking and I was growing up in this deconstruction. My generation grew up in this challenging time. Now the fighting has eased, but the tension still rages in the hearts of the Kashmiri people. In 25 years India has succeeded in crushing the armed rebellion but has failed to crush the political will of the Kashmiri people. The sentiments of the people of Kashmir for the cause only get bigger. Nothing has changed in the last 60 years except 100,000 killings, thousands of orphans, disappearances, mass graves and trauma. But still there remains faith that one day the Kashmir dispute will be resolved, in the hope for a better, just and tolerant future. I salute the people of Kashmir for their courage and resilience. We have lived, and still live through these troubled times, but regardless of the challenges before us, the people of this beautiful land know how to keep smiling. * Noorani was born in Indian Occupied Kashmir. He has been studying and living in Brisbane since 2010. He is a passionate advocator for the resolution of the Kashmir conflict.